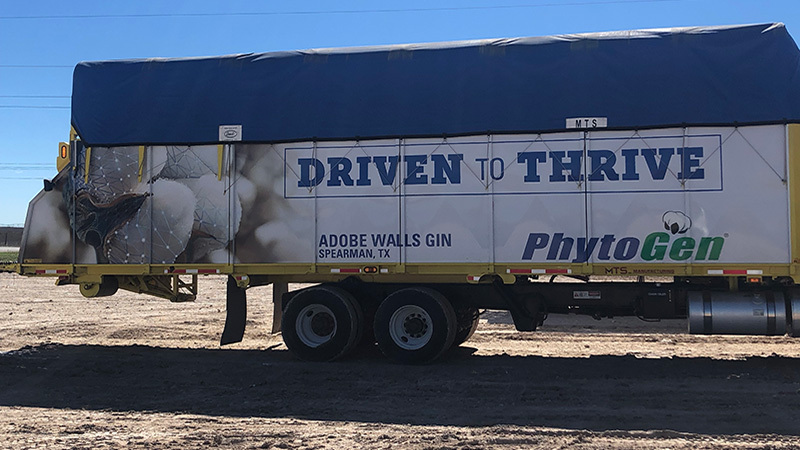 Adobe Walls Gin, the world’s largest, is a partner with PhytoGen in the new Driven to Thrive Yieldmobile promotion. Jerrell Key, gin manager, says the Yieldmobile is an effective and visible way for Adobe Walls to show support for cotton growers and increase awareness of cotton’s importance to the local economy. The Driven to Thrive Yieldmobile promotion has expanded to Spearman, Texas, home of Adobe Walls Gin, the world’s largest. With the 2018 cotton harvest in full swing, more than 100 Adobe Walls employees are working 24/7 to keep the 11 gin stands operating and thriving for maximum productivity. Employees are also embracing the promotion to support customers and thank them for their contributions. Adobe Walls Gin began operation in 2006, built on what was then CRP ground that yielded Hanford County, Texas, about $3 an acre annually. Today, largely due to the growth and success of Adobe Walls, the gin pays the county well over $400,000 in ad valorem taxes annually. It’s a boon for the county and a welcome service for local farmers. Adobe Walls General Manager Jerrell Key says the convenience of having close access to the gin by local farmers is one of the reasons why cotton acres have grown exponentially in the area since Adobe Walls Gin was built. Key says cotton is a great fit for the Texas Panhandle because it doesn’t use as much water as corn or wheat. In 2016, about 70 famers and gin owners formed a partnership and raised more than $10 million to significantly expand Adobe Walls Gin. With six new gin stands and two presses added since the 2016 ginning season, Adobe Walls has increased ginning capacity to 3,000 bales a day, making it the world’s largest. The partners are proud to be a part of such a successful cotton gin operation, but like most farmers, they remain humble. “We had no intentions of trying to be the biggest. We just wanted to help farmers turn cotton to money and do it in a timely way,” Key says. PhytoGen is partnering with select gins across the Cotton Belt in a promotional campaign highlighting the importance of cotton production to rural communities. The Yieldmobile campaign builds awareness of PhytoGen® cottonseed while supporting producers who value high-yielding, high-quality cotton. Anyone who sees the Adobe Walls Gin Yieldmobile can join the fun by sharing the sighting on Twitter @PhytoGencotton or on PhytoGen Facebook. “Participating in the Yieldmobile promotion is a neat way for Adobe Walls to recognize our customers and support their contributions,” Key says. “Our employees are excited about the promotion and are commenting on how much they like the Driven to Thrive trucks. I think the promotion makes them proud to be a part of it. 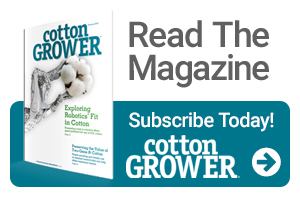 “I am impressed with the dedication of PhytoGen to the cotton industry by developing new cotton varieties that fit well in our geography,” Key says. In addition to its ginning services, Adobe Walls recommends seed varieties that work well for area farmers. To learn more about PhytoGen, go to PhytoGenCottonseed.com. ®™PhytoGen and the PhytoGen Logo are trademarks of PhytoGen Seed Company, LLC. PhytoGen Seed Company is a joint venture between Mycogen Corporation, an affiliate of Dow AgroSciences LLC, and the J.G. Boswell Company.